SUPPORT FOR FINE GAEL has increased by five points in the latest opinion poll. The Millward Brown/Sunday Independent poll shows the biggest government party is now backed by 29% of voters. There’s no such luck for Labour, its coalition party, whose support remains static at 7%. However, the poll suggests that dissatisfaction with the government is at its lowest level in three years, falling seven points to 60%, while satisfaction with the coalition is up seven points to 32%. Fianna Fáil is up one point to 24%, making it the second most popular party in the country, while Sinn Féin support is unchanged at 21%. The rise in support for Fine Gael comes at the expense of independents, whose support has fallen by five points to 19%. The poll was carried out between 28 October and 6 November. 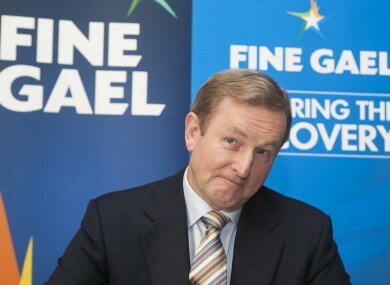 Email “Good news for Enda: Fine Gael support is up AGAIN”. Feedback on “Good news for Enda: Fine Gael support is up AGAIN”.